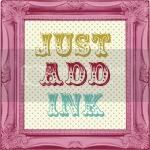 inkyloulou Designs: JAI Challenge 5 - Just Add Dimension - A Frame for the yet to arrive Harry. JAI Challenge 5 - Just Add Dimension - A Frame for the yet to arrive Harry. Phew.......I really didn't think I was going to make the deadline for this week's Just Add Ink Challenge but YAY I have even if it was at the very last minute. So this week's challenge was to Just-Add-Dimension. I have to admit that for most of the week I thought that I wouldn't enter this challenge. Partly because I didn't quite know how to interpret the challenge - was it to create a 3D project??? 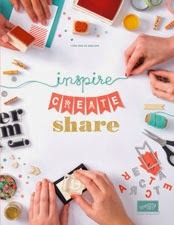 Or was it to add dimension to anything, be it a card, layout or 3D??? I ummmmed and ahhhhhed and wasn't going to submit anything because I just couldn't find anything in the cockles of my brain that made me excited about Just_Adding-Dimension. And THEN IT CAME TO ME!!!! Anyway.......enough babbling preamble. 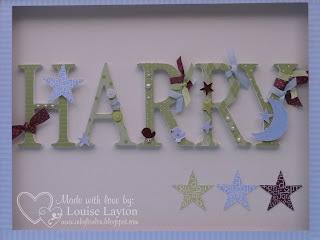 I decided to make a frame to celebrate Harry's arrival (I have made Kate promise that she won't look at my blog). The letters forming Harry are of course a 'Dimensional' aspect but I have added much more dimension too. Now I have made a few of these frames over the last year or so but always with just a single letter ie. "H". This is my first attempt at creating a whole name and I have to admit it is probably my most challenging project to date. It literally had me pulling my hair out- with finding a frame to match, resizing the inner frame bit and recovering with DSP, finding the right colour and material for the background, cutting the letters............ok you get the point it was challenging!!!!! So here it is- Harry's Frame. I'm pretty happy with it however I would have loved to of found a bigger frame so that I could have spread the letters out more. If anyone knows where you can get a variety of these "deep" frames could you please let me know? A closer view - the little stars at the bottom are waiting for Harry's birthdate- one for the day of the month; another for the month; I could have put the year in already but it would have looked silly. And a super-dooper close up. 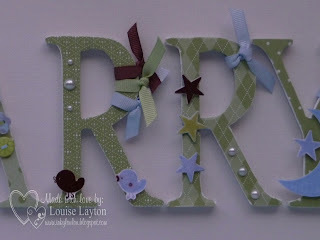 I used the stamps from the Nursery Necessities set (love those super cute little chicks), buttons, pearls and lots of ribbon. Just hoping that I didn't over do it!!!! Now all that is needed is for one little Harry Vallance to come into the world so I can give his Mum and Dad his present. Can't wait to meet the little man. Oh Louise, this is so beautiful! What a fabulous gift for a new baby. I'm sure his parents will be thrilled - I know I would be! Thanks for playing! So glad you got to link it up! Wonderful!! Deep frames - try IKEA or Lulu's (online, expensive delivery!!). Thanks for playing at JAI!